Firstly, let me begin by thanking the Anonymous (claire) poster below for her kind words, and to everyone else recently who has helped to rejuvenate this sorry work. Alas, i didn’t actually watch any tennis last night (was far too busy finishing Scarface and getting over a horrendous cold), but the highlights today were still a treat. 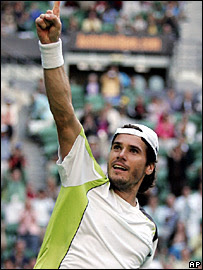 Tommy Haas has always done well in Australia, but this year he really is playing much better than ever before and could very well make the final, certainly few expected the German to conquer Davydenko, the steeliest, and nerveless of opponents. If so i would suggest Roger ups his game somewhat to win. Of course Federer has to get past an Andy Roddick who is looking and playing his best for years, will have to watch that one tonight i think. 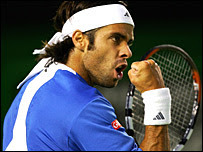 Elsehwere, it seems that everyone is surprised with Fernando Gonzalez’ great run, well he has proven in the past that he is capable of the big wins (defeating Nalbandian, Roddick, Agassi and Ljubicic last year), and when the surface suits him (25-11 record on hard courts in 2006), he is dangerous. New coach Larry Stefanki is no doubt bringing some Henman-esque touches to Gonzales’ game, which will obviosuly pay dividends against such brittle hitters that dominate the modern game. at her performance against Na Li in the fourth, it was something of a big step up to play Kim, who has a fiery intent and will to win in her last year on the tour. She will, – thankfully – tear Sharapova apart, which will be nice to see. this is not claire seriously!!! yet again an interesting piece which i was reading over and over again to enjoy the full inspiration that tennis brings to me. im a anonymous person again.